Most people buy and hang up yellow jacket or wasp traps at the height of the summer, when yellow jacket workers become a real nuisance to outdoor activity as they forage for food. Unfortunately, the ample food supply during the long summer days had the workers not very interested in the traps – you likely will not catch very many. Instead, we recommend you hang traps in the early spring. This is when the queens emerge from hibernation and look for suitable places to build their nests. The traps mimic a good nest location and use a pheromone targeted at yellow jackets. So, instead of deciding your eaves or walls are a good place to build her home, ideally the queen will be drawn into the trap. There is a period of a few weeks after a queen emerges where she does all the work herself. She picks the nest location and builds the initial paper comb, also called the “nest start”. She then lays the initial round of eggs and feeds the larvae, all on her own. All this requires many many flights to and from the nest, and provides a great opportunity to catch her. Which trap should I get? Team Dan The Bee Man recommends “Rescue” brand traps. 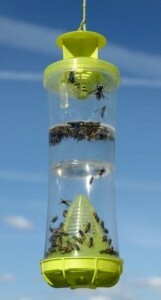 The most versatile being the “WHY Trap“, as it can attract the trifecta of Wasps, Hornets, and Yellow Jackets. They are poison free (much like a crab trap, the insects can get in, but there is no way out), and do not attract honey bees or bumble bees. You can pick a WHY Trap up at most hardware stores for under twenty dollars. Be sure to follow the instructions for baiting and placement that are included with the trap. If you are re-using traps from previous years, make sure to purchase an appropriate refill kit for the pheromones, as those help to attract the queens. You will know when you have caught a queen, especially a yellow jacket queen. They can easily grow over an inch in length, and are fairly squat. If you haven’t caught any queens by the end of May, you may be out of luck as most nest will be well established by then. After the first set of workers hatch, the queen never leaves the nest again, but she will continue to lay many eggs everyday. The nest will grow in size and number of occupants, and has the potential of becoming a real problem. Clients often contact us during the summer because their traps hang empty while the yellow jacket nuisance activity holds steady. The unfortunate truth is that even if you manage to catch any yellow jacket workers in the trap, it’s simply a numbers game that you will lose. Many more new workers hatch every day that you can possibly catch in a standard trap. This entry was posted on Monday, April 4th, 2016 and is filed under DanTheBeeMan. Both comments and trackbacks are currently closed.